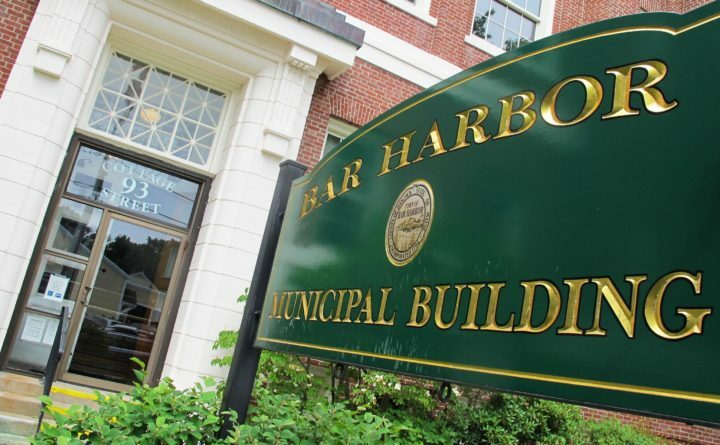 The Bar Harbor Municipal Building on Cottage Street. Photo taken July 17, 2018. Town officials in Bar Harbor are hoping to add one more “to-do” item to federal legislation that Maine’s congressional delegation has re-submitted to Congress. The town council voted Tuesday to request that a 40-acre parcel of woods in the local village of Town Hill be transferred from Acadia National Park to the town. Specifically, the council asked that the proposal be added to companion bills that would, among other things, give congressional approval to an expansion three years ago of Acadia on the Schoodic Peninsula. The land in question, in keeping with a law passed by Congress in 1986, was to be donated by the park to a regional entity that would use it as a transfer station for Mount Desert Island towns, but in the years since interest in building such a facility on the property has vanished. Gary Friedmann, chairman of the Bar Harbor Town Council, said the property still could be developed for public benefit. Affordable housing — which is always in low supply because of MDI’s high real estate prices — or a solar power farm could be built on the property, which is separated from the rest of the park. “No one wants a transfer station [there] anymore,” Friedmann said. Council member Paul Paradis said one problem with the property is that there is no deeded access to it from any of the surrounding properties. But, he added, that problem could be addressed after the land is transferred to the town — if Congress approves the proposal. The council voted 7-0 to ask that the proposed deed transfer be added to the legislation. The companion bills, introduced to the House and the Senate, originally were submitted in January 2017 by then-U.S. Rep. Bruce Poliquin and Sen. Angus King. The House approved the proposal last March but, because it was never approved by the full Senate, the legislation expired at the end of the previous congressional session. With their reintroduction last week, each bill will have to go through the committee review process all over again before advancing through Congress. If the bill becomes law, it would give congressional approval to the transfer to Acadia of 1,441 acres on the Schoodic Peninsula. The way the property was deeded to the park, without approval by Congress, angered local officials who said they had thought the 1986 legislation would prohibit any expansion of the park beyond a set limit. The proposed bills also would allow traditional marine harvesting such as clam or worm digging to continue along Acadia’s shoreline. The practice has become contentious in recent years as Acadia rangers have increased their scrutiny of such activities and, at times, have told harvesters that accessing or taking clams, seaweed or other organisms from park property is not permitted. The legislation also would remove use restrictions on a piece of land in Tremont where the town’s K-8 school is located, which was deeded by the park to the town decades ago, and would make the park’s Advisory Commission, which includes residents from surrounding communities, a permanent entity.